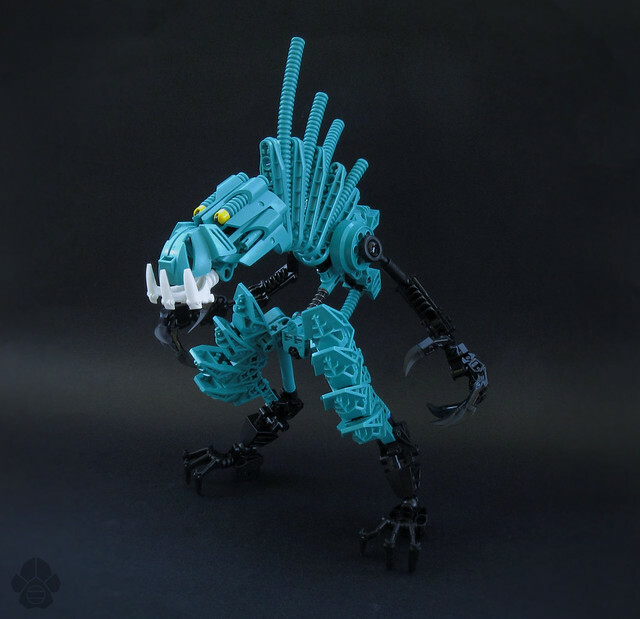 LEGO constraction (construction action figure) themes like Bionicle have introduced a broad range of parts, which many builders have leveraged to create organic-looking creatures. 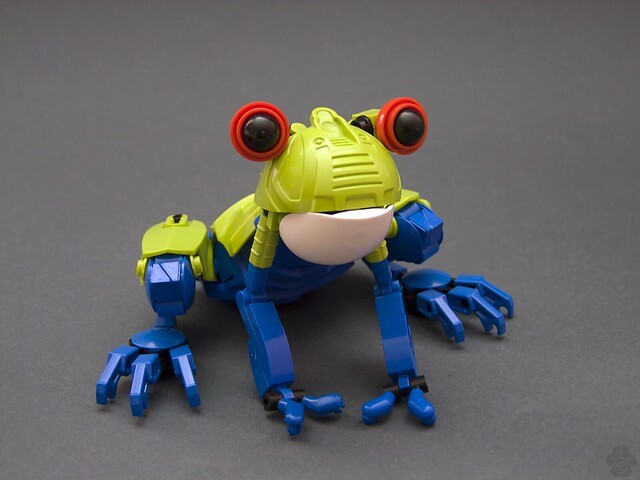 Such is the case with this lovely Ghekula Frog built by Djokson, which they describe as “an amphibious swamp-dwelling Rahi.” I suspect the red-eyed tree frog inspired the build, as is evident in the lime green body, white underbelly, and red eyes. Of particular interest are the feet, which utilize blue robot arms and minifigure arms as toes. The end result is one lively amphibian. 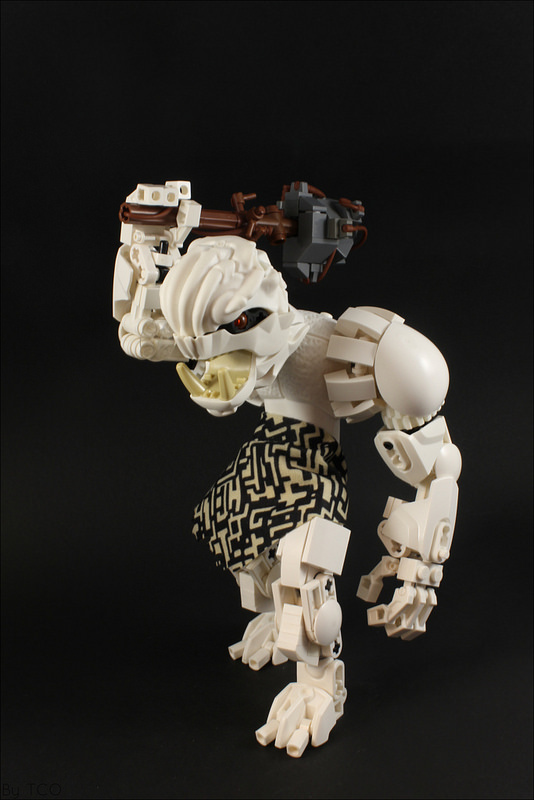 The line of LEGO Star Wars constraction figures has unleashed a plethora of new sculpted parts to feed the Bionicle building frenzy. 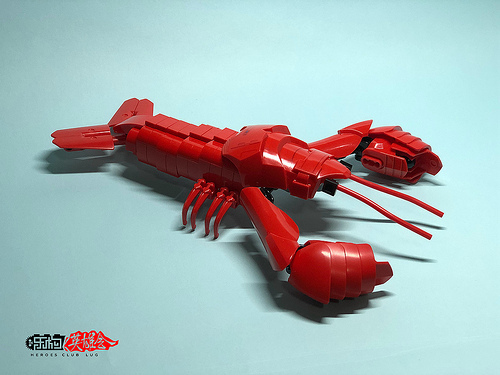 However, this delicious looking lobster by 楚 沐猴 puts some of the parts from LEGO 75529 Elite Praetorian guard to a very different use. The finished product is a crustacean that looks good enough to eat. The line of Star Wars themed constraction figures has introduced a number of great parts for builders who dabble in Bionicle inspired creations. This imposing figure by Loysnuva makes use of the large lightsaber blade found in both 75109 Obi-Wan Kenobi, and 75112 General Grevious in its elaborate head adornment. Along with some excellent reverse jointed legs, the model also makes good of some of the most common elements found in sets today, the car tire. 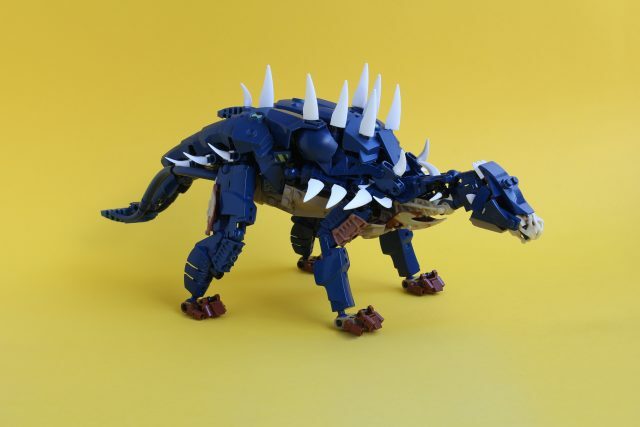 Small tires add some bulk to the limbs and tail, while several inverted tires form the torso. 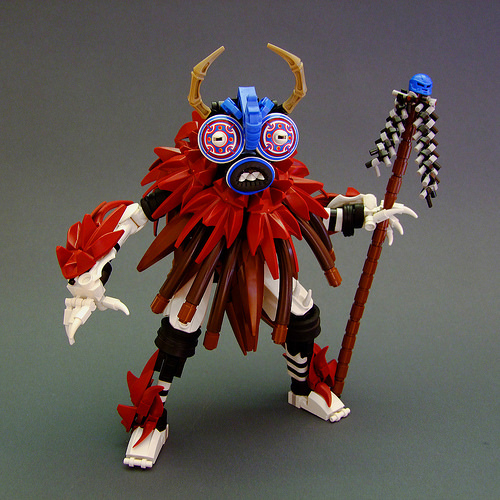 I am mesmerized by Djokson’s latest build, Mask of the Spirit Caller. The bold colors and intricate design of the Orient Expedition shields make the eyes really pop. 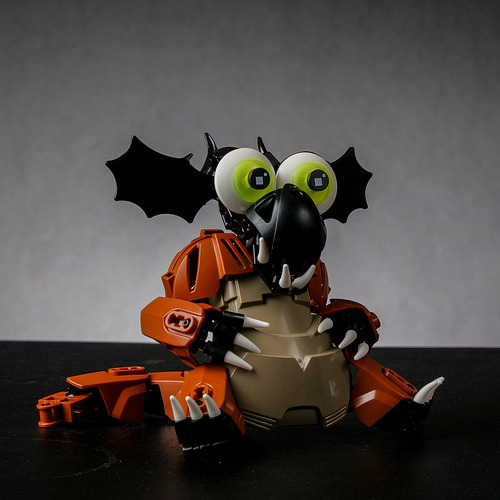 After recovering from the trance induced by staring deep into those eyes, I noticed the rest of the build is quite wonderful as well. In addition to some clever parts usage, particularly the Hero Factory armor plates that ring the neck, this model also has great color blocking. The dynamic pose chosen for this photograph also brings the character to life. Rather than simply showing us a greqt build, Djorkson shows us a moment of a story and invites us to imagine the rest. Of fish tales and fish tails. This old fisherman has probably seen it all! 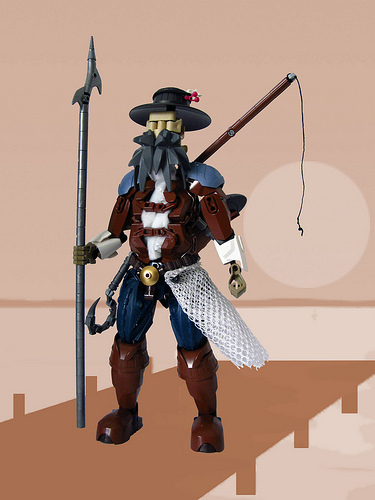 I’m always amazed by fan-built constraction (construction + action) figures like this old fisherman by Dylan Mievis. 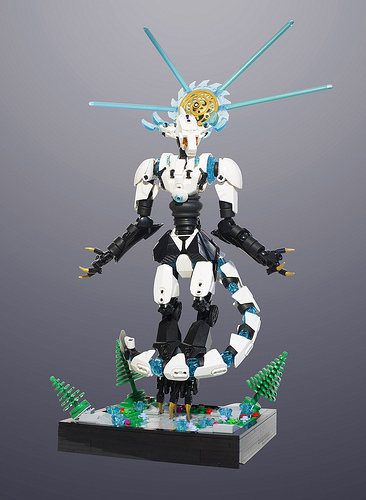 Dylan’s fisherman brings together Bionicle, Technic and System parts to pull off an almost believable looking human figure. Cloth elements are also put to good use, providing the fisherman with a proper net and second layer of clothing. When it comes to the boots, I like how the different parts form their shape, including the upside down barrel halves. His long, gray, grizzled beard and imposing harpoon make me thing this guy has a whale tale or two. With the modification of one of the legs, this would make a great Ahab. I seriously don’t know what this is, but it definitely looks like a grunt that you’d want to stay away from. Builder Leonid An must have had an inspiring day to be able to dream up of this one – someone must have made him quite cross indeed. I did notice Grunt has a great choice of clothing! I wonder where he does his shopping or did Mrs. Grunt go for sewing lessons? The LEGO booth at Toy Fair this year only showcased one buildable or “constraction” figure, a new Darth Maul figure. 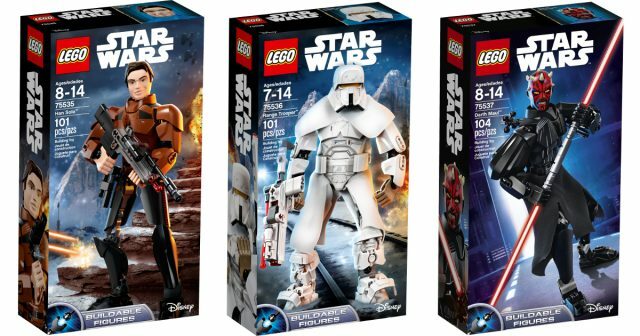 Several other buildable figures from the spring 2018 wave have been revealed today, including Han Solo and the Range Trooper from the upcoming Han Solo movie. When the first Star Wars movie not part of the epic series, Rogue One, was released, people had a mixed reaction. Personally, I loved it, and a lot of great characters were introduced. 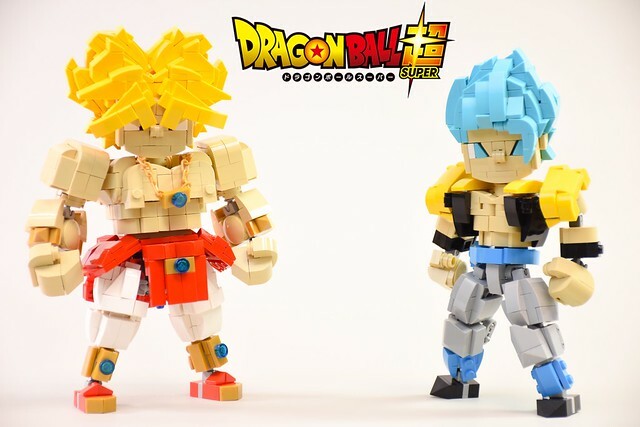 LEGO creator Nobu_tary has been building some amazing creations of a few of them using key parts from the official buildable figure sets, but making a number of delightfully unique design choices to give them personality. 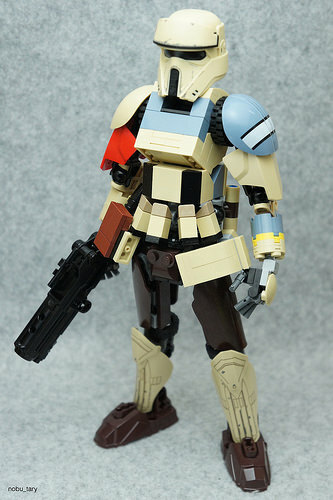 Take this shoretrooper, for example.